This is Team Canada 1987, champions of the Canada Cup, the best international tournament ever. For every generation of Canadian hockey fan, there is a magical moment, a special goal. For some it is Paul Henderson in 1972, for others Sidney Crosby in 2010. I was two years old when Henderson beat the Soviets, and just turned 40 when Crosby beat the Americans in overtime. For me, the goal I will always remember, and recall exactly where I was, is Mario Lemieux in 1987. It was the last Cold War showdown. Not too long after the Iron Curtain fell, the Russians started playing in the NHL, and there was no more mystery. There was no more fear, no more suspicion. Just hockey. It would never be about a clash of our different ways of life. It would be just about a game. And maybe that’s the way it should have always been. September of 1987 was a period of change for me. It was my first year of university, and I had been on my own, away from home, for just a few weeks. To be honest, the last thing on my mind was the Canada Cup. Instead, I was having the crap kicked out of me by English 200, a first-year honours English course. The only reason I took it was because it was the prerequisite for a playwriting course I wanted to take. You see, back then I had aspirations of being a playwright. Those would soon dissolve in a pool of beer, testosterone, and reality. The tournament started and I didn’t even notice. My best friend and roommate, Chris Vining, was into it, watching every game. Meanwhile, I laboured away trying to understand “Beowulf”, “Henry IV”, and “The Canterbury Tales”. I do recall one night Vining coming back to our room dejected because Canada had tied a game he thought they should have won, and he was down – really down. Pretty soon I made the decision to drop English 200. I didn’t want to be a playwright that badly, and quite frankly, I was not enjoying all that classic literature. And I was missing out on stuff like the Canada Cup. Now, I could turn my full attention to the task at hand. Canada was the defending Canada Cup champion from 1984. They started the tournament with a tie against Czechoslovakia, then wins over Finland, Sweden, and the United States. Their round-robin finale would be against their old nemesis – the Soviet Union. The two teams would settle nothing skating to a tie. In the semi-finals, Canada defeated Czechoslovakia while the Soviets beat Sweden, who had defeated the Russians in the round robin. Those results set up the showdown everyone had expected and was waiting for: Canada-USSR for the first time since the 1981 Canada Cup final. That was a one-game, sudden-death affair. This time around it was a best-of-three series – and the teams would need all three games and more. Game 1 had my full attention, but just one play is burned in my memory. The Canadians and Russians had played hard, back and forth hockey that settled nothing in regulation time. The teams were tied 5-5 going into overtime. Then tragedy struck. Alexander Semak came in on the left side and ripped a shot that eluded Canadian goaltender Grant Fuhr. The Soviets had won 6-5, taking a 1-0 lead in the series, and just needing one more win to break Canada’s heart for the second time in three Canada Cups. For whatever reason, I was unable to see Game 2, which was probably for the best because I probably would have been a wreck. If memory serves, I think that was the weekend we went out to Vining’s dad’s place up at Cherhill north of Edmonton. I do recall discovering Canada had won – 6-5 – and we were off to a sudden-death, winner-take-all Game 3 at Copps Coliseum in Hamilton. I don’t have a lot of memories about seeing that game live as it happened. I do remember Mario Lemieux scoring that game winner, set up by Wayne Gretzky, and Mylnikov, the Soviet goalie falling back against the crossbar dejected. After the game, I recall Dennis Reid, who lived at the end of our wing coming into the lounge. He said he could tell Canada had scored because he could hear the cheers ripple up the entire building (we lived on the 10th floor of a 10-storey building). A few months later, I was emotionally drained and really tired from living on four hours of sleep a night for a few months. The life of a student you know. I was at University Health Services waiting to see a doctor, when I picked up an old issue of Maclean’s magazine in the waiting room. I started to read it, and that’s when I re-lived the Canada Cup. The story focused on the stirring comeback by Canada. They fell behind 3-0 then 4-1, when they decided their only chance was to start hitting. The line featuring Brent Sutter and Rick Tocchet hit everything in sight. They even hit each other at one point when a Soviet ducked and they collided. Dale Hawerchuk, who may have been the third best player in the NHL behind Gretzky and Lemieux, had been asked to take on a checking role by coach Mike Keenan, which he did. That was what made Hawerchuk one of my all-time favourites – he would take on whatever role asked of him. a big part of the big comeback in Game 3 of the final. It paid off too. 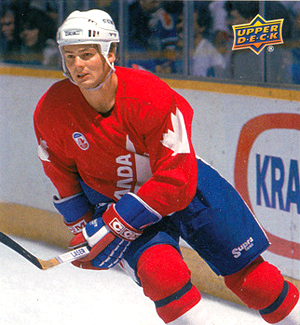 Late in the game, with the score tied 5-5, and the two-on-one developing with Gretzky and Lemieux, Hawerchuk knocked down a Soviet defender, allowing defenceman Larry Murphy to jump into the play and make it a three-on-one. The other thing this story paid particular attention to was Normand Rochefort. He had played in relative obscurity in the NHL, but Keenan saw something in him. In turn, Rochefort responded, playing the best hockey of his career and was Canada’s best defensive defenceman. Reading that article with my emotions raw from girl troubles, exam stress, and teen angst, I was moved to tears. But it really was that kind of a game. It was another nine years before I truly appreciated how great that game was. It was the summer of 1996. I had left the university after nine years. My friend Mark had told me one day that he had rented Game 3 of the 1987 Canada Cup at the Edmonton Public Library. I couldn’t believe it, it just seemed too esoteric to me. I wanted to get to know the library better anyway, so Mark took me to the downtown branch ad showed me the ropes – including how to order that game on tape. A few days later it arrived. I was living in Garneau Walk-ups on campus (because they let non-students live there in the summer). My friend Kevin was a big hockey fan, and we were gearing up for the upcoming World Cup of Hockey, the first one of its kind, and the successor to the Canada Cup. I invited him over and we watched the game. It was awesome. Uninterrupted, with one of my best friends, I finally had the chance to appreciate that game. It looked bleak when Canada went down 3-0 then 4-1. But the Canadians kept coming, and it was the leadership of Sutter, Tocchet and Hawerchuk that brought Canada back. There was also something uniquely thrilling about knowing how it would end. “This is it,” I remember Kevin saying as that fateful play turned from a two-on-one to a three-on-one. We were both thrilled all over again. Another 10 years passed when all of Canada’s games from that 1987 Canada Cup were released on DVD. I am waiting for a special time to watch them. I’m not sure when that will be though. Canada won the gold medal in the 2014 Winter Olympics just over a day ago, and the media is already calling them the best team ever, after the 1972 Summit Series team. In a recent TSN top 10 list, Lemieux’s goal was pushed down below Henderson’s and Crosby’s. Still, I believe that 1987 tournament was the best one ever. It has been the only time ever that all the best players in the world participated. It was a convergence of timing and players staying injury free. Every other major tournament has had glaring absences. Even this year in Sochi, Sweden was missing their best three centres. That alone precludes the 2014 Olympics from being a tournament of the best. Beyond that, the sheer drama and political overtones made it something special. It was the last tournament of its kind ever, and it could not have gone any better.